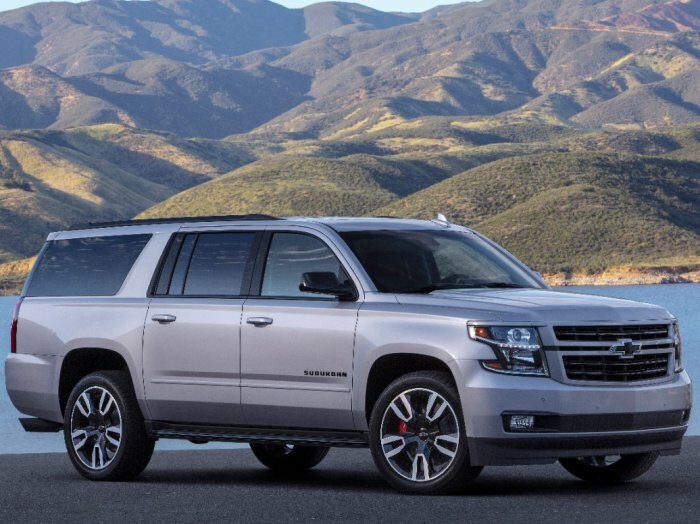 If you have ever thought “I love the Chevrolet Suburban, but I wish that I could get a huge sport utility vehicle with a high performance suspension system and a drivetrain similar to the one in the Camaro SS” – your ship has come in. Chevrolet has announced that the RST Performance Package will soon be available on the big Suburban, packing the 10-speed transmission, the Magnetic Ride Control suspension system and the truck-tuned-variant of the LT1 with 420 horsepower and 460 lb-ft of torque. The Chevrolet Camaro SS is powered by the new LT1 engine with 455 horsepower and 455 lb-ft of torque, with that power being channeled towards the rear wheels by means of an optional 10-speed automatic transmission. The Camaro is also offered with the latest version of the Magnetic Ride Control suspension system, offering the ideal mix of a smooth ride and superior handling. The upcoming Chevrolet Suburban RST with the Performance Package is powered by the truck-specific variant of the LT1, named the L86. Rather than having 455 horsepower and 455 lb-ft of torque, this V8 provides 420 horsepower and 460 lb-ft of torque, with a tune that provides the power delivery needed to get a big four-wheel-drive SUV moving in a hurry while still offering great towing capabilities. While the Suburban RST is 4WD and the Camaro is rear-drive, the high performance SUV will feature the same 10L80 10-speed automatic transmission. As is the case with all of these modern automatic transmissions with 8 or more gears, this gearbox will offer better low end acceleration, smoother acceleration and improved fuel economy numbers on the highway. Finally, the Suburban RST will come with Magnetic Ride Control system. This driver-selectable system can be set to offer the best handling performance or the smoothest ride at the push of a button. Also, regardless of the mode chosen, this suspension system constantly monitors the road surface and the terrain to maintain the “feel” of each particular mode. If you want ever more performance from your Suburban RST, Chevrolet will offer a side-exit Borla exhaust system and a gigantic Brembo braking package. The Borla exhaust system adds exhaust sound, but it also increases exhaust flow by 28% - something that GM claims improves performance and efficiency. The Brembo braking package for the Suburban RST includes 6-piston calipers and 16.1-inch rotors up front, with the unique 22-inch wheels wrapped in Bridgestone P285/45R22 tires at all four corners. We dont have the official pricing yet for the Chevrolet Suburban RST with the Performance Package, but the similar package for the Tahoe costs $2,820 and that is on top of the $2,630 charge for the RST package. Also, the RST Performance Package is only available on the top-of-the-line Premier trim of the Tahoe, so we can expect that the Suburban RST Performance Package models will start somewhere north of $70,000.